LONDON (Sporting Alert) — Olympic champion Shelly Ann Fraser-Pryce was beaten over the 100m, but Mo Farah and Usain Bolt rounded out day 2 at the Sainsbury’s Anniversary Games with victories on Saturday. After running a world-leading 10.77 seconds to win her heat, Jamaican Fraser-Pryce failed to recover from a poor start and was demoted to fourth place in the final, well beaten by Nigerian star sprinter Blessing Okagbare, who improved her national, personal best and area record to 10.79secs. She had earlier ran 10.86secs to win her heat, coming back from a very poor start. Finishing second to Okagbare was American Barbara Pierre in 10.85, equalling her personal best, while Trinidad and Tobago’s Kelly-Ann Baptiste took third in 10.93, with Fraser-Pryce next in 10.94. Home crowd favourite Farah ran a very comfortable 7:36.85 to take the men’s 3,000m after pulling away from the field with 500m left in the race. The Great Britain star Farah, who won Olympic gold medals over the 5,000m and 10,000m inside the same stadium last summer, turned in another fabulous performance for the cheering supporters. 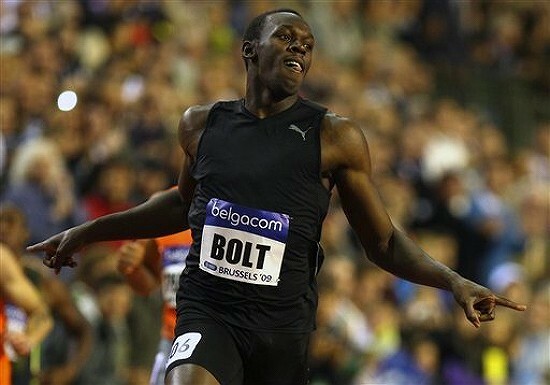 Meanwhile, in the last race on the day, Bolt anchored a Racers Track Club 4x100m relay quartet of Mario Forsythe, Kemar Cole-Bailey, Warren Weir and himself to a meeting record of 37.75secs victory. Great Britain A team failed to get the baton around. Elsewhere at the meeting French Olympic pole vault champion Renaud Lavillenie delivered and world-leading and Diamond League record clearance of 6.02m to win the event in emphatic fashion, while Briton’s Christine Ohuruogu set a season’s best of 50.00secs to win the women’s 400m. There were wins also for Olympic champion Allyson Felix, who held on to win the women’s 200m in 22.41, David Oliver, who took the men’s 110m hurdles in 13.20, while Michael Tinsley warmed up for the World Championships with an impressive 47.98secs to win the men’s 400m hurdles. New Zealand’s Valerie Adams dominated the women’s Shot Put with a series of efforts that was best by a massive 20.90m in the fifth round.